treehouse, originally uploaded by jahansell. Not Sharon - no, I took a day trip to the city and walked from train station to meeting to library to theater, including through Madison Square park, which always has something interesting going on. 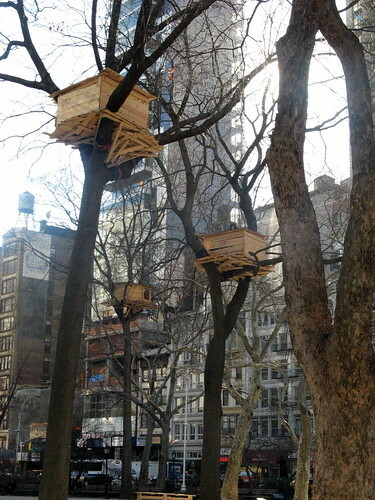 This month, there are a bunch of treehouses, by Japanese artist Tadashi Kawamata. According to the park's website the tree houses are "a crystallization of Kawamata’s interest in the architecture of shelter and of the insertion of private objects into public spaces as a method of renegotiating the meaning of both." This is really cool! How many are they?